Warner Archives continues to release treasures from the WB and MGM movie vaults. One of the great things about the program is that they don't limit themselves to feature films, but also TV shows, and in this case, theatrical shorts. One of their latest releases is a wonderful collection of FitzPatrick Traveltalks, one-reel travelogues that were created by the independent producer James A. FitzPatrick and released by MGM. Originally filmed in black and white, after 1934 FitzPatrick shot in Technicolor and all 60 of the gems in this collection are from that period. (Though not as vivid as one would hope... skip down to the technical section for more information.) This is a great collection that takes a look at a world that, for the most part, no longer exists. 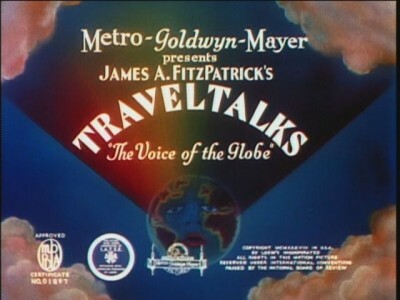 FitzPatrick Traveltalks started in 1931 and lasted longer than most other theatrical shorts ultimately ending in 1954. During this time FitzPatrick cranked out between 8-12 shorts per year, going strong even while WWII raged. (During the war years the locations were mainly in North and Central America.) This set collects shorts, in chronological order, from 1934 (when they were first presented in color) through 1944. It's important to note that not all of the short from that period are included... there are gaps. My guess, and it's only a guess, is that WA is releasing the films that look the best and do not need restoration first, to see if there is a demand for this series. Since it's labeled "Volume 1" hopefully there will be more sets forthcoming. Running about 10 minutes each, each short takes viewers to another spot on the globe that they would be hard-pressed to visit themselves. Focusing on colorful natural wonders and buildings, along with locals wearing their traditional garb (if anyone could be talked into dressing up) these films are a simple document of what a tourist visiting the country would want to see. The politics of the day or what was going on in the world is never mentioned, and that's not necessarily a bad thing. FitzPatrick's audiences were American moviegoers who were trying to survive the depression and while the newsreels covered Nazi Germany and Fascist Italy, these shorts were meant to be a pleasant diversion. Traveling through Europe, the Far East, and Central America with plenty of stops in the USA, it's amazing how many places he was able to bring his Technicolor camera. Though same may find these dull and dry, I found the shorts delightful. It's a window onto a world that no longer exists. 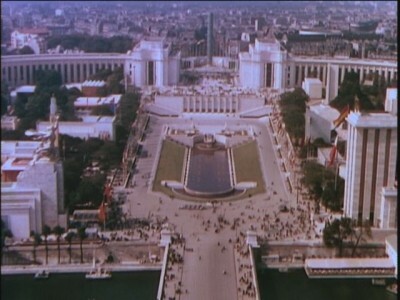 A trip to France, for example, chronicled the 1938 Paris Exhibition. 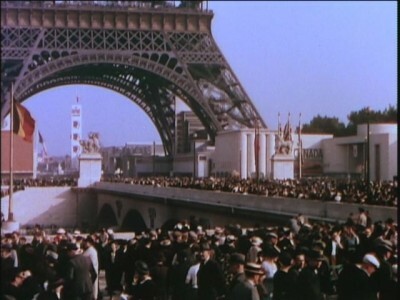 Stretching along the Seine and around the Eiffel Tower, the event had pavilions created by many of the larger nations of the world. These countries went all out, trying to showcase how advanced and creative they were. The Traveltalk itself just showcases the exteriors of the pavilions, but they show the striking buildings constructed by Spain, the US, France, and more. One of the most ambitious is the Russian pavilion that was topped with the 78-feet high stainless steel statue Worker and Kolkhoz Woman by Vera Mukhina. It was one of the most impressive sights of the Expo. It's also interesting to note that Nazi Germany's pavilion, which was just across the street from the Russian exhibit, was not shown. Some of the locations create a bit of a melancholy feeling today however. 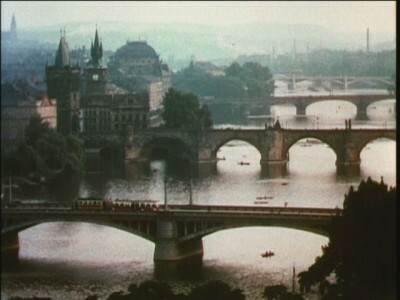 It was a bit sad, for example, seeing Prague in 1938. 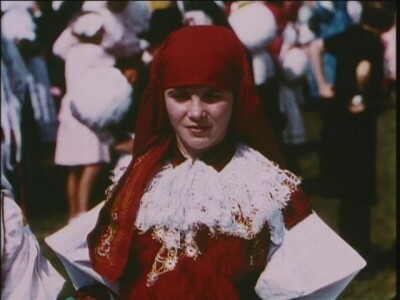 The short captured a parade with colorful costumes and happy people celebrating, and knowing that less than a year after it was filmed Hitler would be in Prague Castle announcing that the country was under German control created a gloomy air. When viewed today, these shorts can also come across as a bit dated and even patronizing. FitzPatrick's narration is a combination of purple prose and stating the obvious at times. We learn, for example, that the cows in the Dutch province of Zeeland are the most contented ones in the world. The children of every country are always described in similar terms: happy, hardworking, and pleasant. He also tends to state the obvious (The food in this country is grown on farms.) and waxes poetically (and painfully) at times (As the setting sun casts its last rays on the beautiful fields we bid adieu!). While I can see many modern viewers rolling their eyes at FitzPatrick's comments, I think they give the shorts a certain charm that makes them all the more enjoyable. The 60 shorts included in this first volume arrive on three DVDs. As with the other recent Warner Archive multi-disc releases, the first print run of this set, when ordered from the WA site, are pressed DVDs rather than DVD-Rs. It has been reported that people who order from Amazon.com will receive DVD-Rs, even if they order early. Presumably Amazon receives a digital file from Warners and is replicating the WA discs they sell in-house. The original mono soundtrack is faithfully reproduced here. The audio on some of the shorts is just a bit muffled, but generally they sound fine with only minor background noise. These shorts were filmed all over the globe on three-strip Technicolor... and the results presented here are so-so. The prints used for this set have not been restored and are either rather old copies of the negatives, several generations removed, or both. The full-frame color image lacks the deep greens and vibrant blues of a Technicolor film. 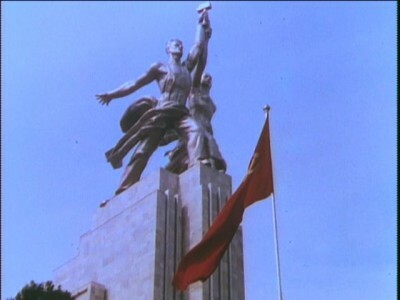 The image isn't sharp either though sources say that these were filmed on 35mm through WWII (the time frame of these shorts). These could be taken from 16mm prints that were struck from 35mm masters also. in any case, the set lacks the visual punch that really nice Technicolor films have. Having said that, as long as you temper your expectations this set will be just fine. The images are generally clear (though a bit soft) and while the colors don't pop, they are still fairly bright and not faded. There is a bit of grain, which is to be expected, and while a couple of the credit sequences are misframed just slightly, the overall result is fine. While some may find them dated, these travelogues from before WWII show a world that no longer exists. Enjoyable as a historical document or as a ten-minute look at another place, these are well worth watching. Hopefully Warner Archives will follow this up with the rest of the series. A strong Recommendation.